US: The immigrant owner of a US convenience store claimed a $338.3 million lottery jackpot Tuesday and said that, despite being catapulted into the ranks of the super rich, his heart won’t change. 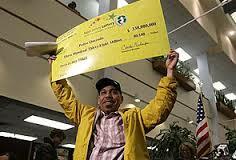 Pedro Quezada, 44, celebrated the golden ticket he bought on Saturday with a televised press conference at the New Jersey lottery headquarters. The Dominican-born man faced 175-million-to-one odds when he bought a “quick pick” ticket with the correct five numbers and a Powerball -- choosing to let the lottery’s computer, rather than his own guesswork, do the picking. Quezada purchased the ticket in an Eagle Liquors store in Passaic, New Jersey where he went regularly to buy beer. “My life will have to change with so much money, but my heart won’t change,” the father of five said in Spanish. One thing that might not change is his lottery habit. Quezada joked he might still buy tickets “in search of more.” Quezada was shocked when he first found out, reports said. It was only on Monday, when he went back into Eagle Liquors, that he realized his good fortune. “He didn’t know he won when he came in because he stopped to check the board,” an employee told the New York Post. “He was shocked and emotional. He said, ‘It’s me!’” Asked in the street by CBS television if the sudden wealth seemed real, he said “Yeah!” then corrected himself to say: “I don’t know yet.” He was also filmed in his modest convenience store, locally known as a bodega, shouting “I’m a millionaire!” into a telephone.